Matt Anderson is going to be coming up to New York with a few amazing custom pieces that will knock your socks off. 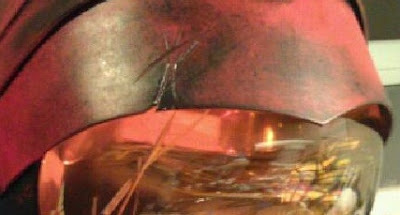 We both agreed we wanted this one to be somewhat of a surprise, so here's all you get for now: this aggravatingly cropped teaser image of a large-scale Toy2R Qee he customized for our NYCC Booth (#876). Matt will be signing alongside Rsin at our booth at 1PM on Friday October 14th. 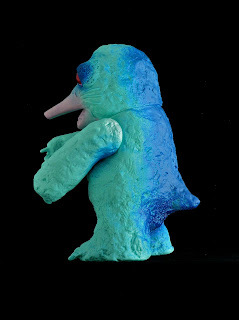 Just a warning: When you actually see this custom fully revealed, there's a 90% chance you will scream and die immediately. Also: Matt loves this custom so much that, if you survive the unveiling and you want to buy it, you might actually have to fight him for it in a brutal cage match. If you want to get the scoop on what Matt's working on, follow his Facebook. 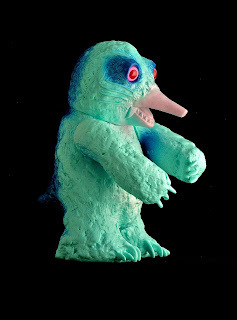 This is the sweet Tenacious Toys Exclusive Molezilla figure by Bob Conge of Plaseebo Toys. This colorway will be highly limited to 5 pieces! You'll be able to buy the TT Molezilla at NYCC booth 876, where we'll be hosting Bob, Osiris and NEMO in a group signing at 3PM Saturday October 15th. Wait till you see what these guys have been working on together. Talk about a highly concentrated ball of talent. I think our booth is going to explode. Our story began on the night of January 19th in the year of our lord 2011 in room 17-b of building 5 on the grounds of an animal testing facility located in East Millstone, New Jersey. Here was the henchman firm that did the dirty work for many of the pharmaceutical companies who bring us those all important products to whiten your teeth, loosen your bowels, color your lips, get rid of your mucus, and many other goodies that give meaning to our empty lives. This company has long had a reputation of going beyond the call to inflict unspeakable acts of torture upon our meek and innocent neighbors in the name of " safety for the superior species " otherwise known as "profit and fear of liability". The payment for the many decades of the Auschwitz like treatment of animals at this facility came due this night of the 19th. Karma was embodied in a mole that had been injected daily for six months with enormous doses of an experimental growth hormone and radioactive isotopes. A lab assistant found the 10 inch mole lying belly up in his damp and dark cage. Assuming the mole had lost its ability to continue suffering for the good of mankind, he dumped the lifeless yet still warm body in to the cart with the others that made their final escape that night. The cart of fate was left in a dimly lit room at the back of building 5 to await incineration at mornings call. The call would not come that morning, for the mole was still alive and the full effect of their experiment was about to be realized. As the mole slowly emerged from the drug induced stupor, the growth hormone treatments of the past six months all kicked in at once and he grew to a hight of 50 feet smashing through the skylight into dark of the night. By morning the behemoth had eaten all of the employes, freed the other animals and demolished every laboratory at the facility. Today is January 20th and Molezilla is sleeping on his full belly in the comfort of the Holland Tunnel. The sign above him reads "Stay In Lane For New York"! We're excited to announce that we will be selling a variety of pieces by German artist Dust at our New York Comic Con Booth #876. 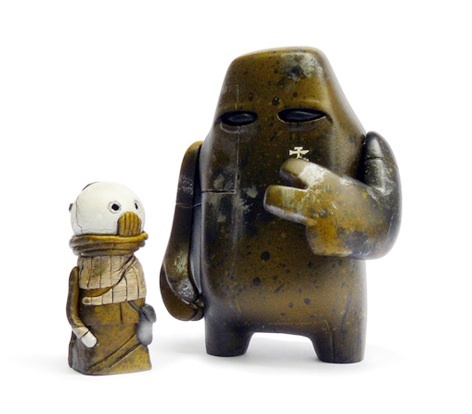 Dust creates polyurethane figures that are around 3 inches tall- they're all highly limited in terms of production numbers, and they're all hand painted. 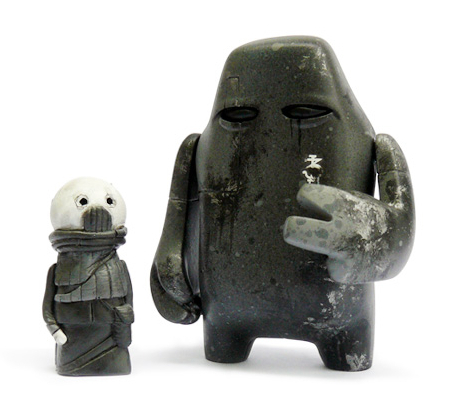 Above is a sculpt called RAS, which we have in 4 colorways: regular, Green Guard, Golden Guard and Grey Guard. Below are his two Teddy sculpts, and his Alter Ego sculpt. 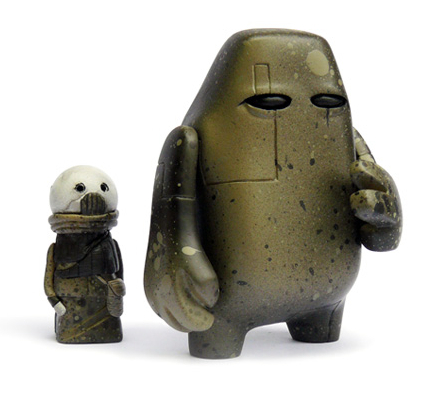 You can follow Dust on his website, and in particular you can check out his toy section. He's got apparel up for sale here. He's also got Flickr, Twitter and he's on Facebook. 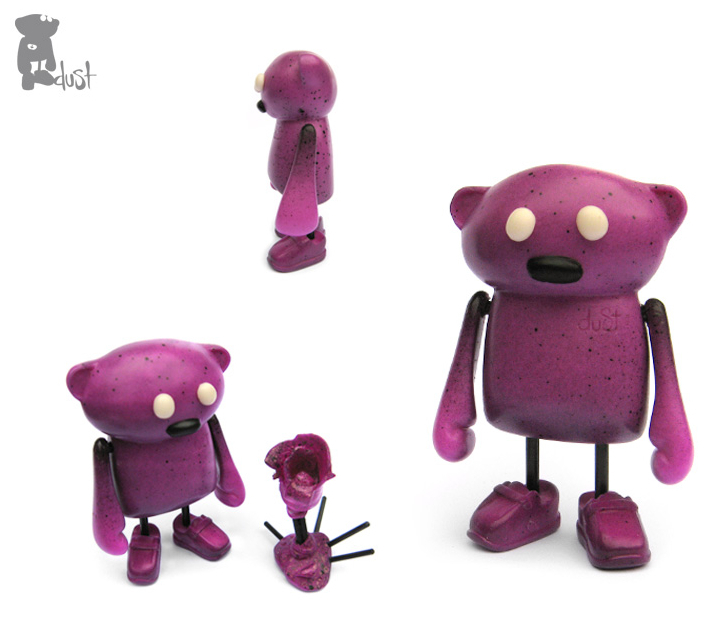 All of Dust's figures are articulated at the shoulders and are highly detailed. Definitely a rare and exciting self-produced group of figures! I have often been asked: "What's with Domo? I don't get it." OK. Domo is one of those things that will never make sense. 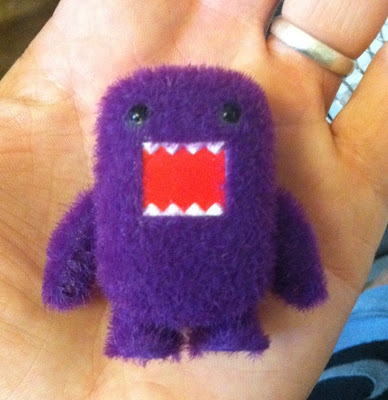 Domo is a square monster with pointy teeth. You might have seen him chasing kittens, and he farts a pink cloud when he's nervous. Inexplicably, this crazy character is the mascot of Japanese TVstation NHK. 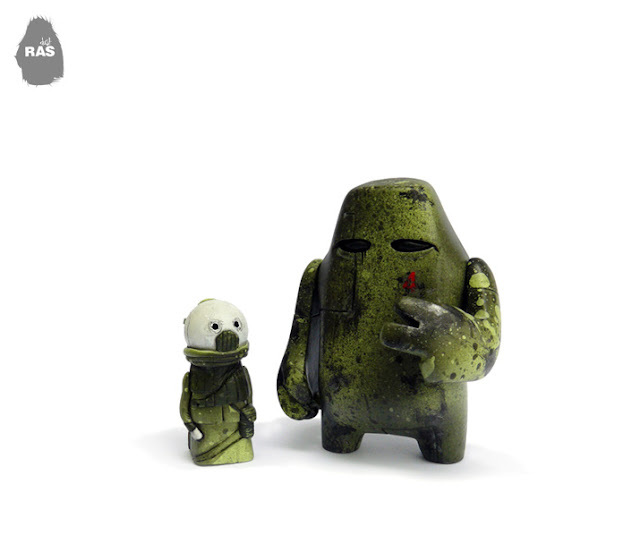 Hong Kong toymaker Toy2R has long produced a vinyl version of Domo in 2" and 7" sizes. 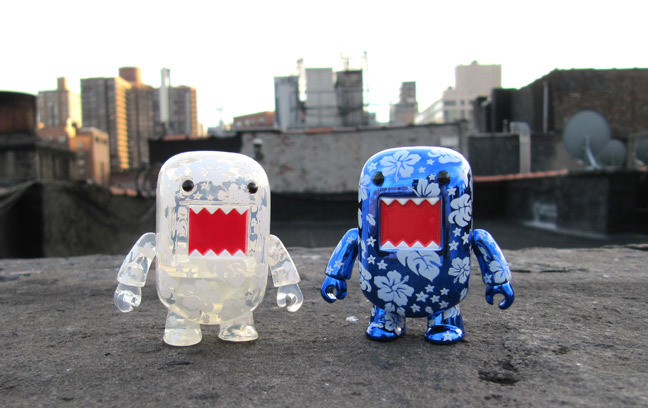 There have been 3 series of blind box 2" Domo figures, as well as countless blister-packed singles, con-exclusive and store-exclusive Domo characters (see the 2011 SDCC Nerd Domo above). 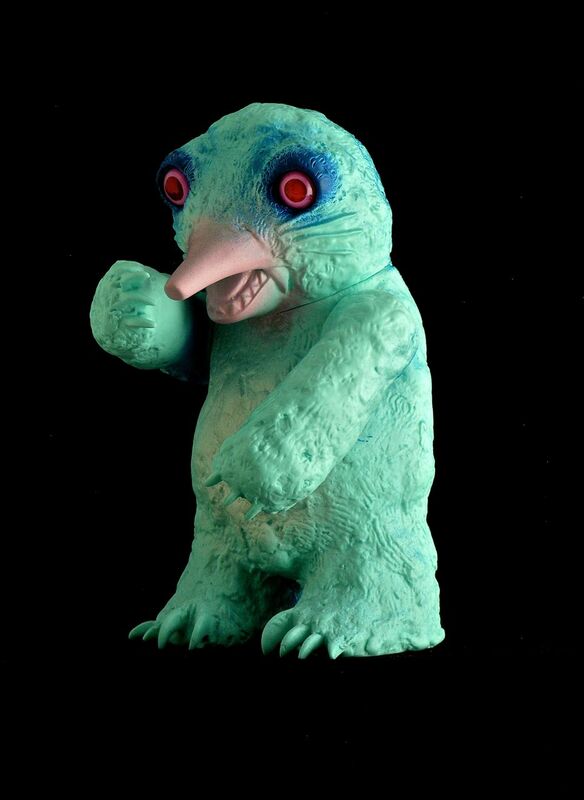 We love Domo so much we gave him his own page on our site. In our never-ending quest to seek out and work with cool artists, we ran across Jeff Beck. Or he ran across us. I can't remember.... anyway, Jeff does awesome character customs so when we were talking about what he should do for our site, I asked Jeff what he was into and he gave me a list of some comics, shows, cartoons.... and we decided upon the new Thundercats! 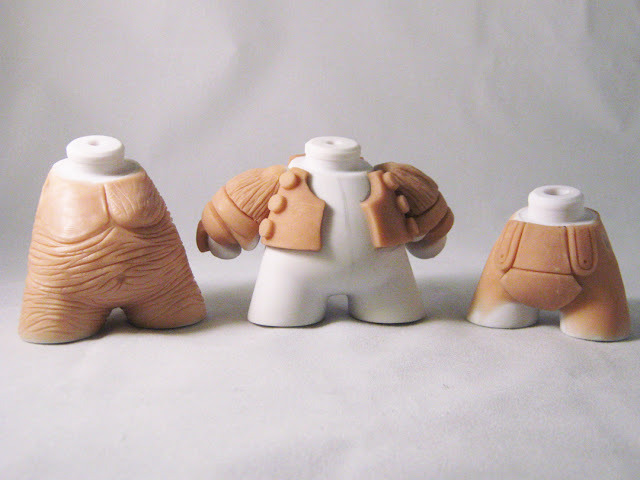 Above are the work-in-progress shots he just sent us of his new Thundercats custom Munnys: Mum-Ra, Panthro and Lion-o, from left to right. 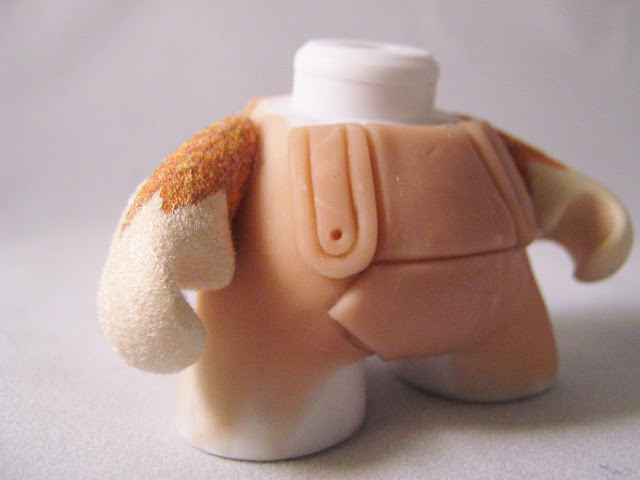 This is the back of Jeff's Lion-O custom, which will be flocked! Jeff started to experiment with the flocking on Lion-O's arm, and it looks AWESOME! Once this series of customs is finished, they'll be for sale in our shop. I'll make a Jeff Beck page in our custom toy section so they'll be easy to find. 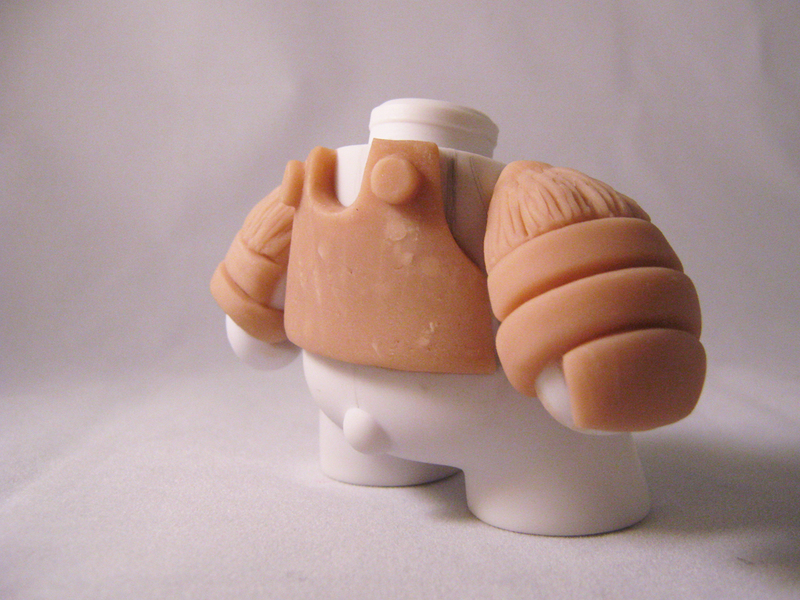 Keep an eye on our blog for more updates on Jeff's Thundercat customs! 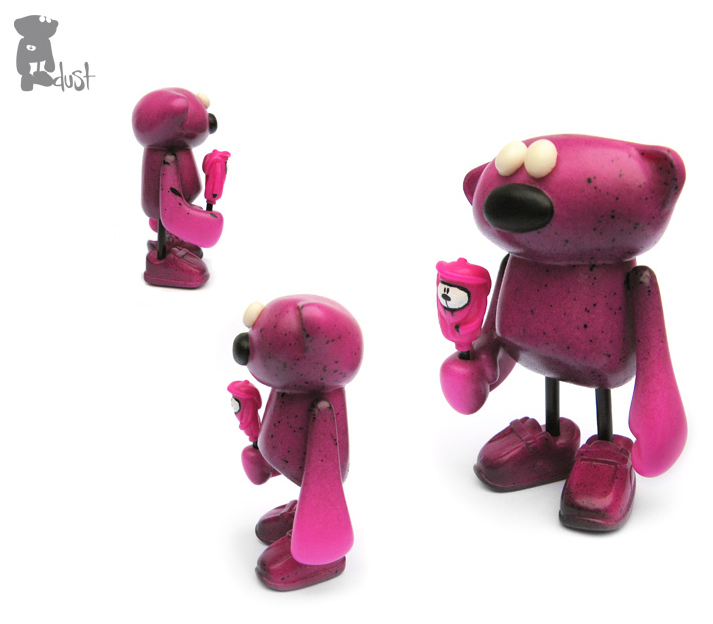 Bad Applez, Inc. has released a clay sketch by NEMO in their shop here. 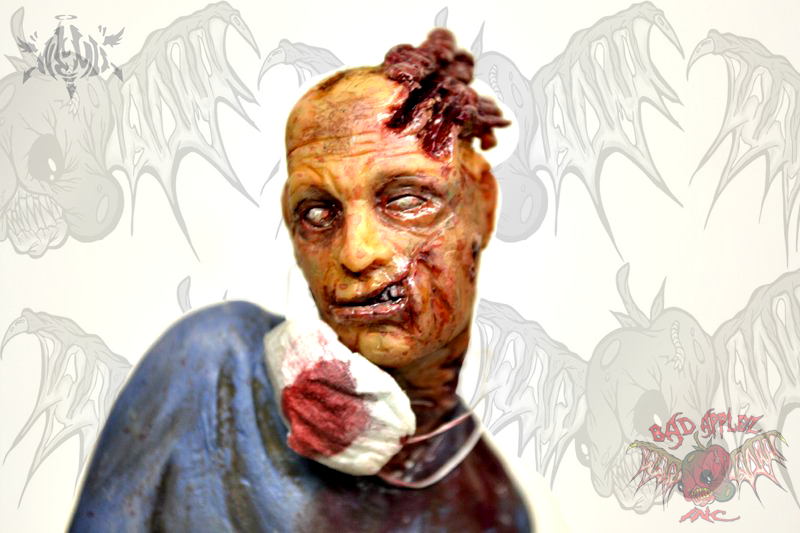 This is a sick one-off piece, handcrafted by Mike "NEMO" Mendez. 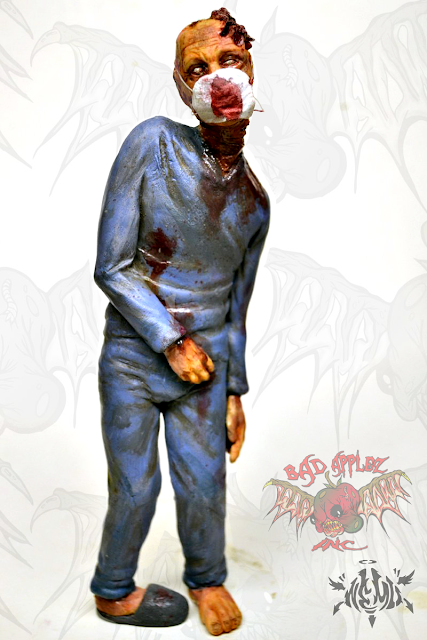 You can find Mike and Rob, founders of Bad Applez, at our NYCC booth for a signing on Saturday, October 15th at 3PM. Booth 876! 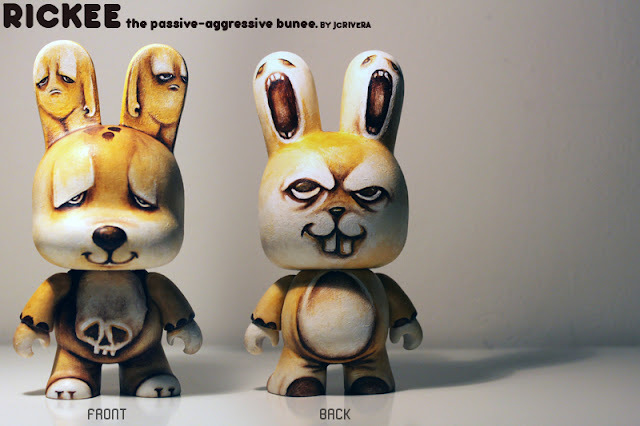 JCRivera will be showing up at our NYCC booth (#876) with a gang of customs. Here are a few sneak peeks: above is his Evil Ape custom, with bulldog accessory made from a Kidrobot Labbit figure! Suitably swagged out for his trip to NYC! 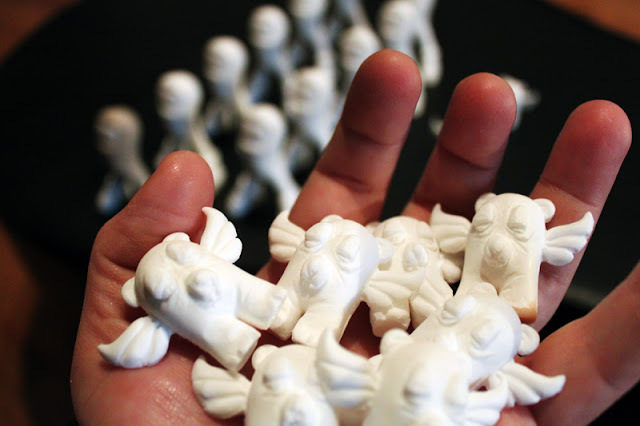 And finally, JCRivera will be bringing in some of his own hand-cast resin figures to give out to those of you who make it to his signing at noon on Saturday October 15th. See you there! 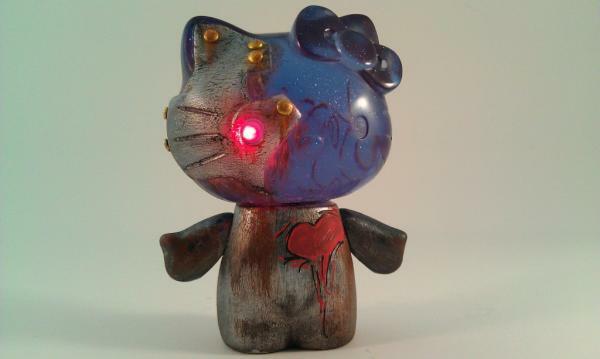 Matt Anderson has completed the first of his Mecha Hello Kitty custom series. He is now accepting preorders for anyone interested in other colorways, which he will be producing shortly. You can add him and message him on Twitter (@MattAcustoms), or find him on Facebook. 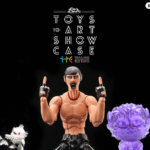 This year, since we are teaming up with Toy2R on a NYCC booth (#876), we wanted to go heavy on the presentation of the Toy2R product line. We therefore decided to stick a Qee on our NYCC marketing materials. 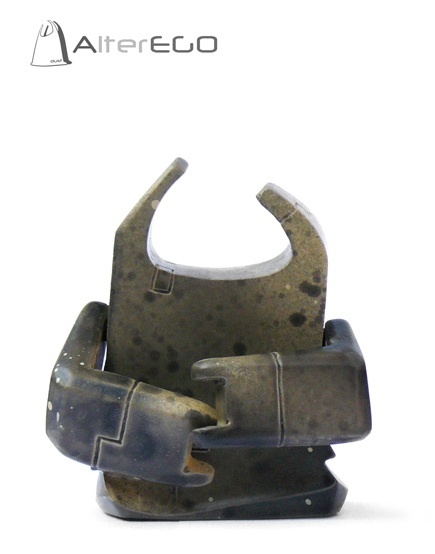 We chose the 5" Mini Qee Toyer as our featured product, a sweet $15 DIY platform toy offered by Toy2R. 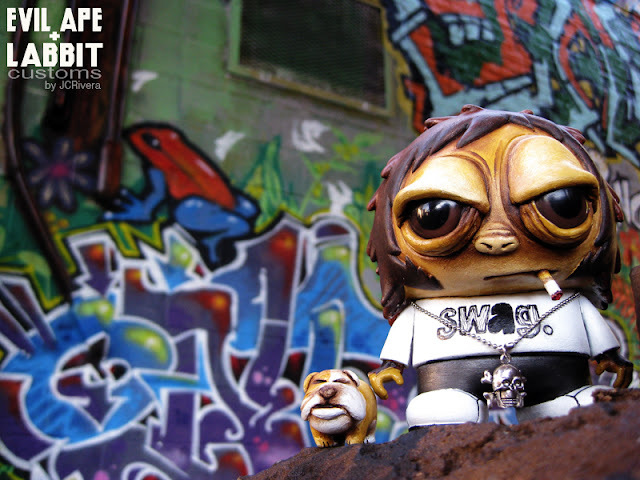 Our side of the postcard shows a Mini Qee Toyer customized by local hero/artist Mike Mendez, aka NEMO. 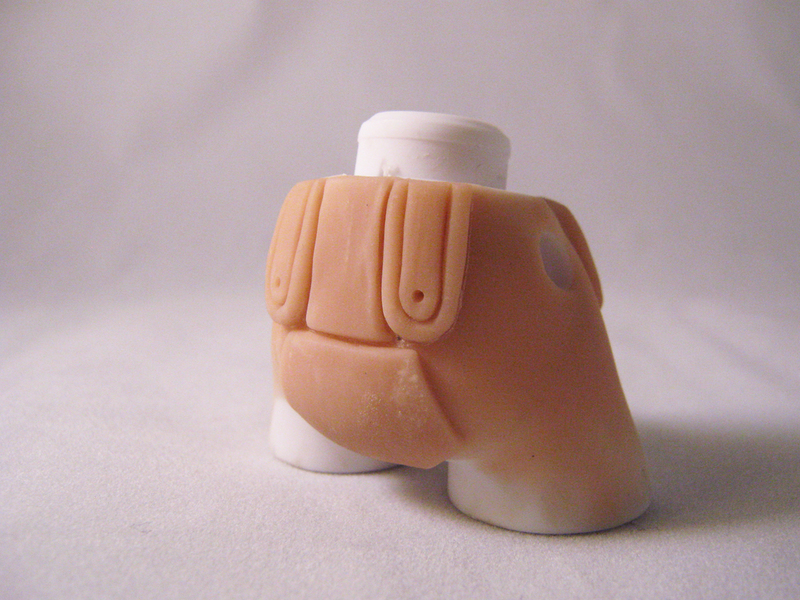 The reverse side, the Toy2R side, shows the Mini Qee platfrom in all its beautiful, clean, white glory, ready to be customized. You can meet NEMO, along with Rob Ingellis and Bob Conge, at a group signing at 3PM on Saturday October 15th. These 3 artists are actively collaborating on a number of projects, so this is your chance to meet all three at once! Booth 876. Be there. Check out what happens when we send some art cards to the UK to be reviewed by Dan Byrne, without giving him ANY background whatsoever about the Sidekick Lab product line! He's a little confused by some of the more esoteric cards, but that's to be expected. Great video. Much respect to DesignerToysUK. Check out their new Facebook page too!